Resin Pendant Necklace - "Mademoiselle Violette"
Mixed Media Necklace - "Unchain My Heart"
Resin Pendant Necklace - "Heart of Erin"
These gorgeous earrings are perfect for your holiday parties, and will add sparkle to your special events year round. 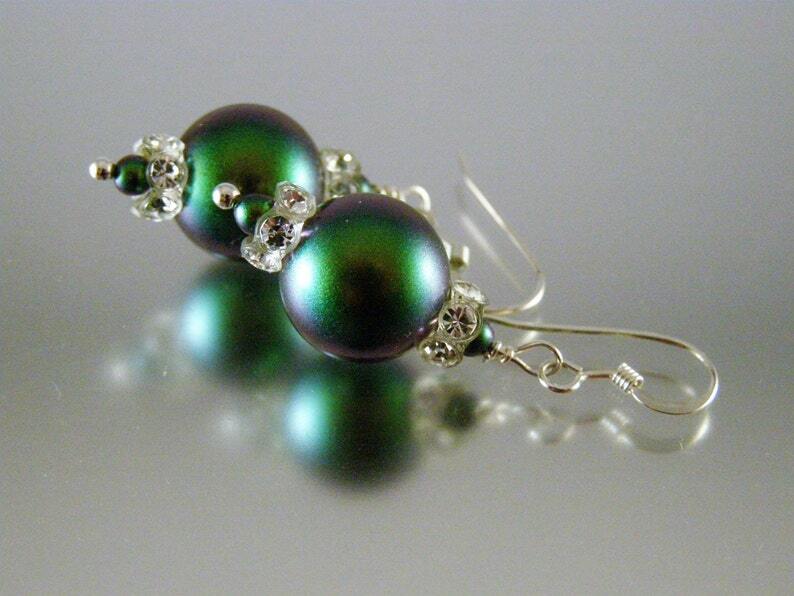 The earrings feature Swarovski pearls in Scarabaeus green, which gives them an almost Peacock irridesent finish, and are highlighted with Swarovski crystals. The earwires are Sterling silver. The earrings measure about a little under an inch long from the bottom of each earwire. Pendant Necklace- "Go for Baroque"
Bee and Flower Necklace - "Sweet Life"